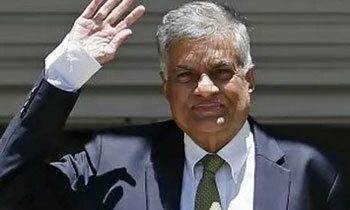 Prime Minister Ranil Wickremesinghe left for Switzerland this morning to attend the 47th Annual Meeting of the World Economic Forum in Davos, Switzerland. Please take your time and do not hurry back. People need a break. Bon voyage Globe Trotter. This appears why you've become PM, not to serve the Country or the People. Only Committees, Plans etc etc seems to be your limitation. Even as the opposition leader in the past he was out of the country most of the time. PROPOSED NAMES FOR SRILANKAN LEADERS, BAT MAN , SUPER MAN , SPIDER MAN.......... BECAUSE THEY ARE ALWAYS ABOVE THE GROUND LEVEL. Rajapakse can now start the ball rolling! You may have to double up before he returns.